Sikhism, said to have stemmed from the teachings of Guru Nanak Dev, is based on various beliefs that are quite different from other religions. Read on for more about the Sikh religion and culture. Sikhism, founded about 500 years ago, is a religion which comes from the word 'Sikh' which, in Sanskrit, means a disciple or a student. Sikhs believe in one God and do not practice idol-worship and/or racism. They follow the teachings of their ten masters (called Gurus) and their Holy book, called the Guru Granth Sahib. From 1469 to 1708, the ten Gurus spread a simple message of devotion to God, equality amongst all, trust and honesty. Some major teachings also instruct people to serve mankind, provide food to the starving and lead a charitable and simple life. The place of worship of Sikhs is called a "Gurudwara" which literally means "Door to the Master". Liberal as this religion is, there are no constraints on who can or cannot enter a Gurudwara for blessings. Sikhism also propagates infinite positivity and hopefulness which is why the Sikh-community happens to be a flourishing one worldwide. This religion strictly prohibits consumption of any form of tobacco and opium although these laws are little relaxed with respect to meat and alcohol consumption for most of the Sikhs. 'Guru Granth Sahib', the Holy book of the Sikhs is also known as the final and immortal Guru. The first version of this book, known as the 'Adi Granth', was scripted by Guru Arjan Dev, the fifth Guru of Sikhs. Later, Guru Gobind Singh, the tenth Guru, added more principles, teachings and beliefs to 'Adi Granth' and this final version was called 'Guru Granth Sahib'. It includes Gurubani (teachings of the masters) in the Gurumukhi script and is considered the divine guide for mankind and the chanting of its hymns is known as 'Ardas'. Guru Nanak Dev (1469-1539) was the founder of Sikhism and his elder sister Bibi Nanki, was his first disciple. Although, most of the religion is based on what he preached, some influence of Sant Kabir can also be seen on account of the camaraderie that the two shared. Guru Angad Dev (1504-52): Assumed the title of Guru in 1539 and developed Gurumukhi, the script of Punjab. Guru Amar Das (1479-1574): Assumed the title in 1552 and set up the rituals for birth and death; his famous hymn Anand Sahib is now the daily prayer of Sikhs. Guru Ram Das (1534-1581): Assumed the title in 1574 and established Amritsar— the sanctified place of Sikhism—in 1577. Guru Arjan Dev (1563-1606): Identified as the Guru in 1581, he wrote the Adi Granth and built the Golden Temple in Amritsar. Guru Hargobind (1595-1644): Titled Guru in 1606, he gave the concept of two swords ‘Meeri’ and ‘Peeri’—one for spiritual purpose and other for worldly reasons. These swords now form the symbol of Sikhism. Guru Har Raj (1630-1661): Assumed title in 1644 and was the grandson of Guru Hargobind. Guru Har Krishan (1656-1664): Identified as Guru in 1661, he was the only Guru without a beard as he assumed title at the age of five and died of small pox when he was eight years old. Guru Tegh Bahadur (1621-75): Titled Guru in 1664, he showed the correct path to the devotees and set up the religious center at Anandpur. Guru Gobind Singh (1666-1708): Assumed title in 1675. He was the founder of Khalsa and was also known as the saint-soldier. He declared the Guru Granth Sahib as the spiritual and eternal Guru and also introduced ‘Khande-di-pahul’ (initiation with a double-edged sword) in 1699. Sikhism is based on the teachings of Guru Nanak Dev who spread the message that God can be seen only through meditation and by helping others. Over the course of his life, Guru Nanak Dev became associated with Sant Kabir who helped lay the foundation of this religion. The teachings of Sikhism were hence quite influenced by Sant Kabir’s beliefs also. Sikhs became known as the martial race from the 19th century when the Christian missionaries and Arya Samaj movement of Hindus tried to enter Punjab with an intention to take over the province. It was then that the Singh Sabha Movement came ahead and fought for the protection of Sikh culture and successfully defended their beliefs. Later however, Mughals became worried at the spread of Sikhism and started torturing the supporters. It was at the time of Maharaja Ranjit Singh (1780-1839) that Sikhism was re-established and became the foremost religion. Sikhs who were known for their physical power and bravery contributed in the world wars and the fight for Indian Independence. Unfortunately, the partition in 1947 wrecked more havoc on Sikhs than any other community. In the late 19th century, Sikhs migrated to the western countries mainly to Canada, Australia and United States. 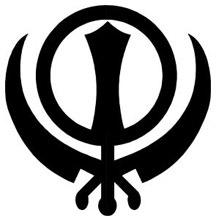 Like all other religions, Sikhism also has a distinctive symbol called the ‘Khanda’ which comprises of a circle called ‘Chakra’ that symbolizes the immortal God and two ‘Kirpans’ (swords) which signify ‘Meeri’ and ‘Peeri’—the twin concepts of temporal and spiritual authority presented by Guru Hargobind. Sikhs follow the rule of the five Ks: kēs (uncut hair), kaṅghā (small comb), kaṛā (circular iron bracelet), kirpān (dagger) and kacchā (special undergarment). These are the most sacred and crucial things that define a pure Sikh. Sikhism mentions five deadly evils—anger, greed, ego, affection and desire—which must be overcome with sympathy, modesty, charity, positive attitude and satisfaction. There are two different types of Sikhs: ‘Amritdhari’ and ‘Sahajdhari’. Sahajdhari Sikhs are those who believe in all the tenets of Sikhism but do not necessarily follow all. They include regular Sikhs who may consume meat (not ritually slaughtered), consume alcohol (never smoke) and may even cut/shave their hair. ‘Amritdhari Sikhs’ are those who have taken Khande-ka-amrit (the holy water) and follow all the tenets of the Guru Granth Sahib religiously. Marriage is called ‘Anand Karaj’ (auspicious work) which is performed in the Gurudwara. The couple makes four circular movements around the Guru Granth Sahib before being declared man and wife. Another common word used for Sikhs is “Khalsa”. This comes from an Urdu word “Khalis” which means pure. Sikhs in the Mughal era were referred to as “Khalisa” meaning “Pure People”. At present time, this religion is spread all over the world and is considered the world's fifth largest religion with more than twenty million followers. Chandigarh, Haryana and New Delhi are the most prominent Indian Sikh cities while United Kingdom, Australia, America and Canada are the most common foreign destinations for them. The famous pilgrimages of Sikhism in India are Gurdwara Bangla Sahib, Gurdwara Rakab Ganj, Gurdwara Sis Ganj in New Delhi; Paonta Sahib in Himachal Pradesh; Sri Guru Nanak Sat Sangh Sabha in Tamil Nadu; Hemkund Sahib in Uttaranchal; Takht Sri Hazur Sahib in Maharashtra; Sahib Takht Sri Keshgarh Sahib in Anandpur, Punjab; Sri Akal Takht and the Golden Temple in Amritsar and Takht Sri Damdama in Bhatinda. The most important festivals of this religion are Guru Parvas (or Gurpurabs)—Festivals of the Gurus—which are the celebrations based on the lives of the all the ten Sikh Gurus. Vaisakhi or Baisakhi comes on 13 April and marks the start of the New Year and the end of the harvest season. Bandi Chhor Divas or Diwali is celebrated as the day on which Guru Hargobind was released from the Gwalior Fort, with some innocent Hindu kings who were also trapped by Jahangir, on 26 October 1619. Hola Mohalla is the day after Holi and is celebrated the day when the Khalsa Panth gathers at Anandpur and displays their warrior skills. Another well-known Sikh festival is Lohri which is generally celebrated on 13th January to celebrate the harvest of Rabi crop.